You’ve got yourself a slick, shiny new MacBook, so it’s only right that you treat it with the style with which it deserves. No neoprene laptop sleeves for these marvels of modern engineering; you need only the finest materials to complement the use of aluminum and glass. You need a wooden laptop case lined with leather. These sweet cases, designed by woodworker Rainer Spehl, are sized especially for the MacBook and 15-inch MacBook Pro (although it appears they’re for the last generation, non-unibody models). Each is carved from wood, lined with soft Corinthian leather and features magnetic fasteners, just like the MacBooks themselves. 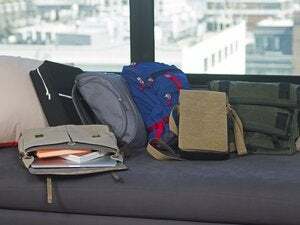 Sure, it may not be the lightest laptop case you could slide in your bag, but that's not the point, is it? No price is listed on the official site; instead, you're invited to contact the creator if you're interested in buying one. Which, as we know, means that they don't come cheap—but there’s nothing too good for your MacBook, right?